Charles Carlson is Chief Executive Officer of Horizon Publishing, an investment newsletter publisher. He is also Chief Executive Officer of Horizon Investment Services, a money management concern. Mr. Carlson is editor of DRIP Investor investment newsletter and is a contributing editor of Dow Theory Forecasts investment newsletter. Mr. Carlson, who has earned a Chartered Financial Analyst (CFA) designation, holds an undergraduate degree in Journalism from Northwestern University (1982) and an MBA from the University of Chicago (1993). He is the author of nine books, including the best-selling Eight Steps to Seven Figures (Doubleday), Buying Stocks Without A Broker (McGraw-Hill) and No-Load Stocks (McGraw-Hill). Some of his other books include Individual Investor Revolution (McGraw-Hill), The Smart Investors Survival Guide (Doubleday) and Winning With The Dows Losers (HarperCollins). 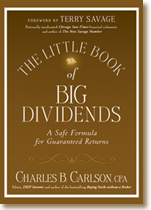 His latest book, The Little Book of Big Dividends was recently published by John Wiley & Sons. Mr. Carlson’s comments appear in such newspapers and magazines as The Wall Street Journal, The New York Times, USA Today, Newsweek, U.S. News & World Report, The Washington Post, Money, Business Week, Forbes, Barron's, and Kiplinger's Personal Finance. Mr. Carlson also appears frequently on television and radio shows, including CNBC, CNN, NBC's Today Show, and Business Radio Network. He lives in Valparaiso, Indiana.